Takabatake Ransen Kaika hyaku monogatari (1875) | "Kaika" as a pun of "civilization"
The term "kaika" was well-known to TNS story writers. The most prolific was Takabatake Ransen (1838-1885), who by the time this print was produced had published a collection of "kai" and "ka" stories entitled 怪化百物語 (Kaika hyaku monogatari < kwaikwa [kaika] hyaku monogatari < kuwawi kuwa hiyaku monogatari) -- which might be translated "One-hundred tales of [civilization as] mystification". 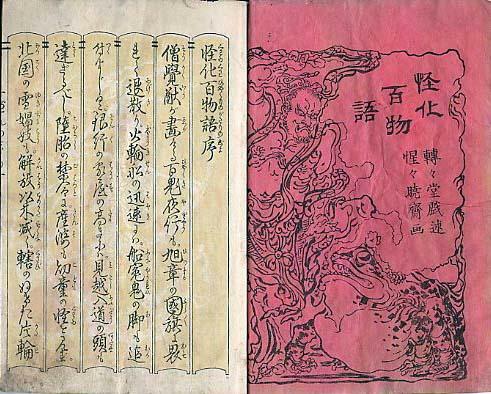 The collection came out in two volumes or books (巻 kan, maki), each of one fascicle (冊 satsu), consisting of 22 and 21 pair (丁 chō) of folded leaves or folios according to Takagi Gen (NDL's description of 18 and 21 leaves is incorrect). The colophon, at the end of Volume 2 (下の巻 shimo no kan), gives Meiji 8-5-18 (18 May 1875) as the date of the granting of "official permission" (官許 kwankyo, kankyo) to publish. 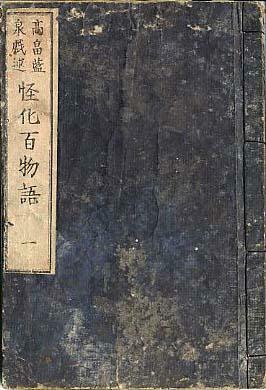 Unlike the title on the cover and preface, the colophon title uses 恠, an alternate form of 怪. In a postscript on the colophon page, Takabatake states that a draft of the book had been finished and left to hybernate during the winter of the previous year, until his friend Inoue prepared a clean manuscript and otherwise sweated to publish the work. The colophon of the copy shown by Takagi Gen (see below) does not show the publishing particulars -- the addresses and names of the author and publisher of a publication -- but, as he observes in his article and transcription, the NDL copy shows these particulars in two adjacent boxes of slightly different design, as follows. Minanmi Honjo Ishiharachō became part of Honjo-ku in 1878, which became part of Sumida-ku from 1947. Kobikichō became part of Kyōbashi-ku in 1878, which became part of Chōōku from 1947. The "large district, small district" (大区小区 daiku shōku) system was established nationwide in 1872 to refine the "district" system which had been set up in 1871 to facilitate household registration. Within each "large district" were several "small districts" consisting of small towns and villages. These administrative units continued until 1878 when the county, ward, town, and village (郡区町村) system was established. 1889 marked the start of the city, town, and village (市町村) system. The dates of the writing and publishing of Kaika hyaku monogatari correspond to the period when the Yokose village story was published -- first in the newspaper Tokyo nichinichi shinbun (12 December 1874), then in the TNS news nishikie (circa spring 1875). Takabatake signed and sealed the preface of the collection as Tentendo Shujin, in precisely the same manner as he signed and sealed most of the TNS stories he authored. Takagi Gen has posted a transcription of the texts of both volumes, on his website, based on a copy in his own library. He observes that there are also copies in the National Diet Library and at Waseda University, while Seoul University has a copy of the second volume, and that they are of the same priting and binding. The text on Takagi Gen's website is a slightly corrected version published under his supervision in SNKTB (see Sources below). There are also, he notes, a transcription in a 1928 collection of materials on Meiji culture. The illustrations are signed by Shōjō Kyōsai (惺々暁齋), better known as Kawanabe Kyōsai (河鍋暁斎 1831-1889), who produced numerous drawings and paintings of imaginary beings and beasts, including several "hundred demon night parade" works. The above images were copped and compressed from 怪化百物語 as posted by Takagi Gen (高木元) on his website Fumikura (Text Archives), an repository of historical sources related to 19th-century "minor stories" (shōsetsu) in Japan (日本の十九世紀小説に関する研究資料の書庫). For web versions of Takagi's transcription of Kaika hyaku monogatari and his article on Takabatake's life, and other features related to "minor stories" in 19th-century Japan, see Takagi's website, Fumikura (Text Archives). For more about Takabatake Ransen as a writer of fictional stories in the early Meiji period, see "Minor stories" and style: The essence of "shōsetsu" and news nishikie. "Kaika" as a pun of "civilization"
The graphs 怪化 (kwaikwa, kaika) have commonly been used to pun 開化 (kaikwa, kaika) -- the second part of 文明開化 (bunmei kaika), a slogan which practically defined the Meiji period. "Bunmei kaika" is usually understood to mean "civilization and enlightenment" in English. Though more closely associated with "civilization", the term "bunmei" (文明) actually refers to the "enlightenment" that comes from the process of "kaika" (開化) or "civilization" as a process of "opening" and "developing" a country or territory. For a contemporary news nishikie story that not coincidentally punned 怪化 and 開化, see TNS-876 Mysterious incidents. For a latterday play on these two words, see Bunmei kaika (文明怪化), the fourth title in Takahashi Katsuhiko's Kanshiro hirome tebikae historical mystery series. Kyogoku Hatsuhiko's "kōsetsu hyaku monogatari"
Kyōgoku Natsuhiko (京極夏彦 b1963) is best known for a series of stories collected as "100 tales of towntalk" (巷説百物語 Kōsetsu hyaku monogatari). As of this writing (2010), four collections have been published and a fifth is in progress. The years are for the hardcover editions. Bunko editions have also been published. The above dateThe third collection, shown here, won Kyōgoku a Naoki Prize in 2004 -- one of two such awards given in the prize's 130th round for the second half of the year. Most of the tales have first been published in Kadokawa's quarterly magazine "Kwai" (怪) since 1999. The first five of the six tales in the third collection appeared in "Kwai" (Volumes 11-15, September 2001 to August 2003), while the last tale was written for direct publication in the book. Some of the tales in the first two collections began to appear in manga versions in 2001 and in anime (animation) versions from 2003. Some television versions were produced in 2000, 2005, and 2006. The anime versions, of 13 tales as of this writing (2010), are widely distributed on DVDs. The DVD episodes have been adadpted into English under the collective title "Requiem from the Darkness". The tales of the first two collections are set in Edo and other parts of Japan during the 1830s and 1840s, before the fall of the Tokugawa government. The progatonist, Yamaoka Momosuke (山岡百介), tired of writing children's stories, sets out to collect one-hundred tales of mysterious (怪 kwai) incidents involving the spooky and grotesque in the adult world. In the course of his quest, which his name appears to pun (百 hyaku, momo), Yamaoka crosses paths with Mataichi (又市), leader of the Ongō (御行), an odd trio of vigilantes whose mission in life is to investigate gruesome incidents and exact gruesome punishiments on the perpetrators. The tales in the third collection unfold "later" (後 Nochi no), during the early years of the Meiji period, after Edo has become Tokyo. In these tales, an older and wiser Yamaoka gives advice to four men who endeavor to solve contemporary incidents which have legendary associations. The tales in the fourth collection are set "earlier" (前 Saki no), and involve Mataichi and his cohorts before they meet Yamaoka. The tales in the third collection are set a decade into the Meiji period, but there are many references to the recent and even more distant past. The main characters are four men who share an interest in stories about the mysterious and strange (怪異 kwaii) -- Yahagi Kennoshin (矢作剣之進), a Tokyo policeman; Kurata Shōma (倉田正馬), the second son of a former samurai, a returnee from a trip to the west and an aficionado of things Western, now unemployed; Shibuya Sōbei (渋谷惣兵衛), an expert swordsman, schooled in Confucian thought, owner of a dojo, self-appointed trainer of police in sworsdmanship; and Sasamura Yotarō (笹村与次郎), formerly a retainer at the Edo residence of the lord of Kitabayashi domain, now an employee of a trading company, and a lover of odd and curious tales. Mataichi and his cohorts are dead. Yamaoka Momosuke, in his eighties, is called Ippaku Ō (一白翁) -- "venerable" or "old" Ippaku" -- by friends who respect him for his knowledge of old tales about the mysterious. Sasamura, who had known Yamaoka in the Tokugawa days, is again in touch with him regarding their common interest in such stories. Chapter 2 of the tale opens with a scene in which Sasamura is explaining the origin of the legend to his three companions -- Kurada, the policeman Yahagi, and the bearded Shibuya. Kurada is described in passing as a "Japanese" who, despite his Western affectations, is "physically unmistakably of the Yamato race -- his stature being neither extended [height neither tall] nor his nose high [long]" (page 455). The men talk about the legend, apparently based on an incident that is supposed to have happened a century ago. But it stumps even Yahagi, who, because his role in solving certain mysterious cases has been reported in Tokyo nichinichi shinbun and Tokyo eiri shinbun, his friends regard as an authority on stories of strange things (妖物噺 bakemonobanashi). Pages fly as the men discuss all manner of subjects that might have a bearing on the mountain man. The legendary mountain man is said to have had black skin and red hair (page 460). Man or beast? Maybe it's a kind of monkey. It seems there are many kinds of monkey's in the world. Our country is narrow [small], but it wouldn't wouldn't be surprsing if the mountain man was a beast that simply hadn't yet been discovered. (page 462). One view leads to another until, by the end of Chapter 2, Kurata has stated that China describes itself as such because it is large place, with many countries and tribes, and minority races have been persecuted and discriminated against, but gradually they have been assimilated, and all that is left are stories of changlings (化物). No, no, says Yahagi, who says he's not talking about minority races in other countries, but in Kurata's own island country. There is talk about the Yamato race (大和民族), the closed-country period (鎖国時代), the formation of a single race (一つの民族), but isn't that superficial? How is that related? Indigenous people (先住民) or not, who knows, but aren't there unsubmitted [unsubjugated] people (随わぬ民in) in this country? Well, if you're talking about Tsuchigumo (土蜘蛛), Emishi (蝦夷), and Kumaso (熊襲), that was many centuries ago. No, there are aborigines (先住者) in Ezochi (蝦夷地) even now. Not to mention the people of the country of Ryūkyū (琉球国の者). Their langauges and customs are different. It wouldn't be at all surprising a people with a different culture (異文化をもつ民) survives in the mountains. Monkey or man. One or the other, for certain. It a monkey, we can't do anything about it. If it's man, though, we've got to do something. But we live in the age of Enligthenment and Civilization (文明開化). There are no distinctions (区別) between samurai, farmers, craftsmen, and merchants. No, but there are distinctions between the nobility, shinzoku, and commoners. Ah, but bushi have abandoned their swords, and commoners are permitted to have family names. And hasn't the ban on commoners' riding horses also been lifted? But the mountain man -- if he's human -- has neither a household register, nor a home or clothes. Chapter 3 begins with a report of the case of Ine, the older daughter of Gamō Mosuke, a farmer in Nogata village in Musashino. Ine had gone missing three years ago, namely in Meiji 6 (1873). Mosuke, the biggest farmer in the village, raises a variety of crops, but also makes money in other enterprises, for which he employes all manner people of various skills and classes, and treats them equally. Not a few local people are said to be unhappy with Mosuke's disregard for people's low status (身分), some of whom are simply jealous, others reacting to the fact that he does not give preference to local people. The narrator segues to a discussion of the "deep rooted discrimination (差別) toward status and birth (身分素性)" -- such as those of chōri hihin status (長吏非人身分), itinerant people (漂泊の民) who have no fixed address (page 475). 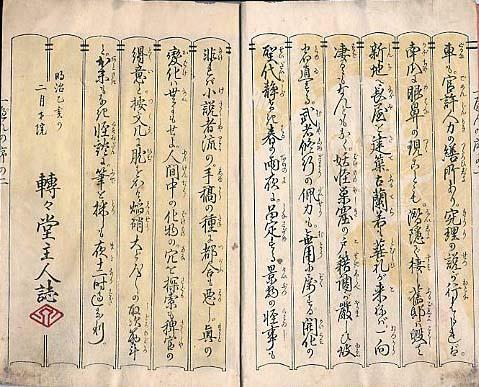 The Great Council of State proclamations of Meiji 4-8 [Meiji 4-8-12 = 12 October 1871], concerning the abolished of eta, hinin, and other such statuses, and the recording of occupations and names in family registers, are cited in their entirely -- and then interpreted. The proclamations are said to have "eliminated status discrimination, by liberating people of discriminated classes" (被差別階級の人人を解放することで、身分差別を撤廃した). Five more pages are given to the implications of these proclamations, for society generally, and for Mosuke in particular (pages 476-481). It's not that Ine had returned as such, Yahagi clarifies. Rather she had been taken into custody on the outskirts of a village in the vicinity of the foothills of Mt. Takao (page 483). She claims to have been assaulted by a giant mountain man. And by Chapter 4, Yahagi is seeking the guidance of old Ippaku (page 496). The plot thickens and twists for nearly seventy more pages and three more chapters. The dialogs Kyōgoku puts into the mouths of his characters, and his own narrative voice, are fun to read -- if one ignores his sometimes overly obvious effort to engage the reader in the on-going debate about the human condition in "Japan" and "Japanese" national character, and to lecture the reader on the history of social discrimination. All such matters could have been dramatized to greater effect, more in keeping with the times. But that would have taken more effort and skill on the part of both the writer and reader, and arguably have resulted in a less popular book.